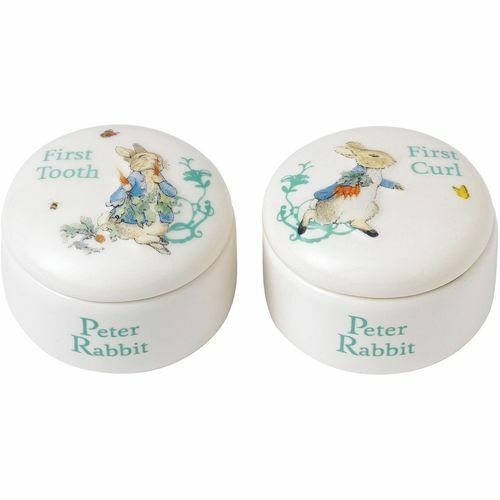 Peter Rabbit First Tooth and Curl box set of two from the Border Fine Arts World of Peter Rabbit Nursery collection. White ceramic circular keepsake boxes with a raised images on the lid of Peter Rabbit sat eating carrots (First Tooth) and Peter Rabbit running from the garden with a handfull of carrots (First Curl). Border Fine Arts has been producing The World of Beatrix Potter resin figurines since 1987 and over the years, it has developed an impressive range of collectible items that appeal to Beatrix Potter patrons of all ages and from all walks of life. More mature customers may well appreciate the value of these classic collections, but the characterful, handcrafted and hand painted figurines also make a wonderful gift for children of any generation.